Whilst the industrial locomotive itself has been fairly well documented - as it deserves to be - other features of the industrial railway scene are less well recorded. Unusual rolling stock, track layouts and routes, buildings and traffics seem to get but scant attention. Many enthusiasts would, for instance, probably be surprised to learn of the existence of more than a few snowploughs in industrial use. Obviously, snowploughs are only needed on the longer and more rural lines, and not on a works system for instance. Ironstone tramways come into this category, and some notes regarding the three narrow-gauge examples on the Kettering, Wellingborough and Eastwell systems may therefore be of interest. Because no photographs exist, to my knowledge, of them in action, I have sketched KETTERING FURNACES No.8 clearing the cutting near the main A6 road. The Kettering Iron & Coal Company's 3ft 0in gauge locos were well known as they operated one of the last narrow gauge ironstone tramways. The plough was half hidden under a pile of old wagon timbers and wheels against the side of the "top shed". This occasionally very useful piece of ironmongery appears to date only from 1947, and presumably before that date it was a question of shovels and hard work. It was a simple home-made job consisting of plate steel welded on to a frame and suitably braced. The blade was V-shaped and slightly sloping. Eagle-eyed visitors may have noticed on Manning Wardle locos No.7 and No.8 two apparently useless brackets bolted to the rear buffer beam. These brackets in fact took the snowplough, the weight however bearing on the buffer beam. Originally No.8 only was equipped for this duty, No.7 acquiring her brackets in 1958. During that winter there was a rather bad snowfall. One afternoon No.8 and No.6 were heading back to the furnaces on their last trips of the day. A heavy snowfall since the outward journey had covered the line and eventually, near Chestnut Tree Loop, the trains became stuck - and there they stayed. Rescue operations the following morning were delayed whilst brackets were made in the workshops to fit to No.7. This sort of thing was not uncommon at Kettering - on a later occasion in October 1960, No.6's chimney fell off during the trip before lunch, whereupon the workshops produced a new temporary stovepipe during the lunch hour! Probably in a last gesture of defiance the tramway snowed itself up early in 1963 when demolition was within a mile of the furnaces. When all other available work had been completed the snowplough had to be brought out to clear a way. Luckily it still existed. despite the fact that practically everything else didn't! The Wellingborough example on Stewart & Lloyds Minerals metre gauge system was similar to the Kettering one but, although still V-shaped, it sat vertically to the track. It is alleged to have been made up before World War 2, presumably at the furnace shops, but this is difficult to reconcile with the fact that the 1942 Peckett (2029) was the only one capable of carrying it for some years. The plough was fitted by being bolted temporarily to the locomotive's front bufferbeam through holes provided in the top corners, bearing again being on the buffer beam. Hence the puzzling holes on the front end of Peckett 1871 which acquired them when Peckett 2029 was under repair at the critical time. This plough appeared to be quite regularly used when conditions warranted it, the Wellingborough line being quite exposed as it climbed out of the valley to the pits near Finedon. Otherwise, of course, it lay behind the shed, an unnoticed but unusual piece of equipment. 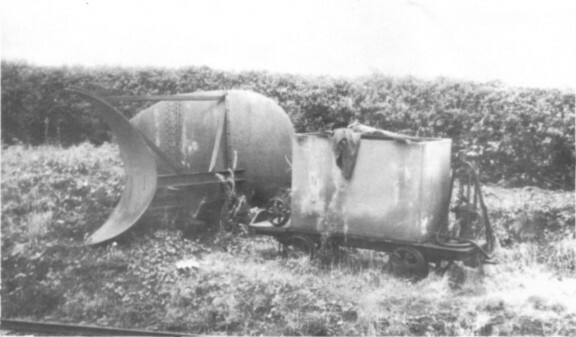 The once extensive 3ft 0in gauge ironstone system at Eastwell in north-east Leicestershire also had a snowplough. It was said to have been acquired secondhand, maybe from a main line railway company and although at first this seems rather unlikely, it is a very professional looking job as can be seen from the photograph. I would welcome further details of this one as I have no further information. The Eastwell snowplough with what - a weed killer wagon? Author's photograph taken on 15th November 1959.